Time for an updated look at the common historic features of peaks in cyclical equities bulls, with the focus on the US market. Developed economies are flirting with deflation, in line with demographic trends. However, recent action in commodities suggests that class may be gearing up to outperform as late cyclicals and deliver a temporary inflation shock to help roll the global economy into recession. Tentative breakouts to be watched. In short, with history as our guide, we have a fairly comprehensive case for a cyclical bull market top in US equities having occurred at the turn of the year. 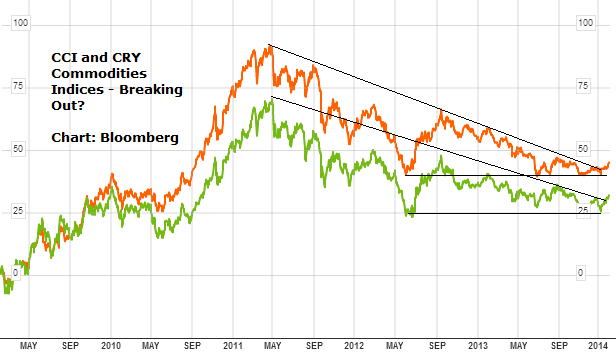 A late cyclical rally in commodities to deliver a short inflation shock would complete the picture. For equities, drawing together both the time and price guides of the analogies, we should now be alert to the possibilities of both a building out of a ‘second chance’ lower high and a more pressing collapse into waterfall declines. Something Happened At The Turn Of The Year…..
Hi again, Jonh, in the prior article, I suggested you that could be posible that in Real prices could see in the future, -next movement in the Industrials- lower prices than in march´09, but not in Nominal prices. Do you contemplate this possibility. Ok, thanks, time will tell. Thank you for your frequent updates. Your charts show, that at former tops the upmove to the „second chance“-point began above the upper trendline of the preceding distribution zones. Today the Dow is already in the upper third of this area. 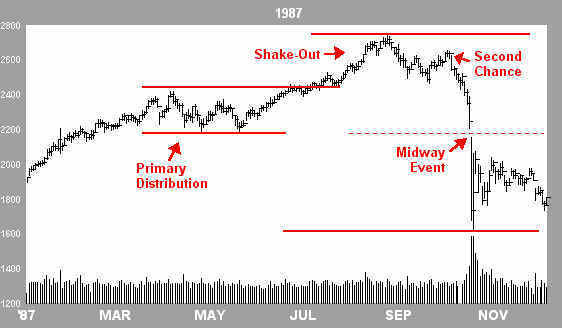 Here one can find a chart of the average course of the Dow following a decline of more than 4% in January http://www.godmode-trader.de/artikel/der-januar-knock-out-und-die-folgen,3651100. 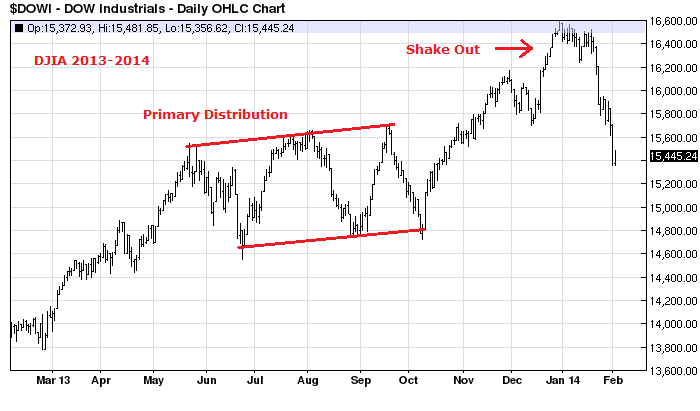 It fits very well to your Dow 1929 chart. Furthermore the dow has already cut the December 2013 lows. As Jeff Saut is pointing out, this creates a very high statistical case for a further decline of more than 9% over the rest of the year http://www.financialsense.com/contributors/jeffrey-saut/tinker-evers-chance. 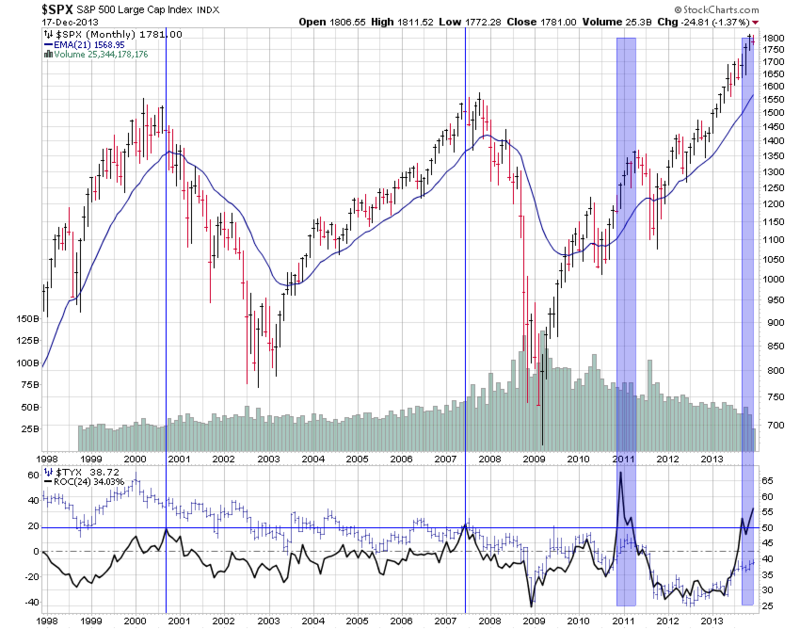 Should the overbought rally reverse today, I would look to August 2011 as a possible guideline. 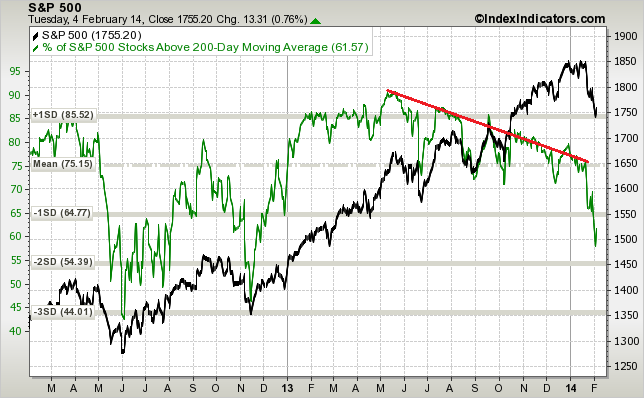 For now the only chart that is puzzling me a bit, is the cumulative A-/D-line ($nyad). As of yesterday the weekly hasn’t broken its 10 ma, which is, what it almost always has done soon after the start of a major decline since 2007. Yes the cumulative AD isn’t playing ball. 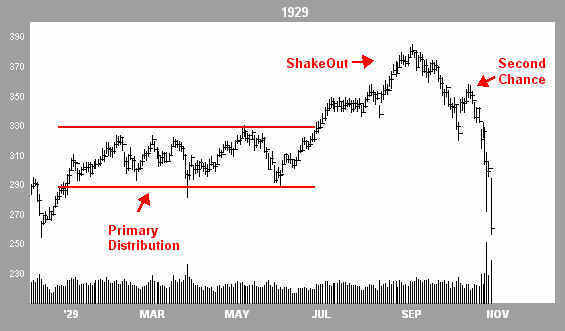 I can find just two previous Dow tops – 1937 and 1946 – where that breadth measure did not diverge before the top but effectively topped out with the index. So that scenario is possible, but it has not been common. John, I read somewhere a while back that due to so much flash trading, advance/decline line divergence does not happen any more. How would that work Kent, to prevent it? John, have you found any instances where the “second chance” made a higher high before the big sell-off? Don’t know of that, but I’d consider that to be a different kind of top: a topping process with an initial high than a second marginally higher high on negative divergences. What the above 4 have in common is the increasing rate of ascent into the top – parabolic on the longer term view – a blow off top. So I think we are due to build out that ‘second chance’. Decline ended at day 23. This bounce should be short and sharp retracing more than 60% of the decline. 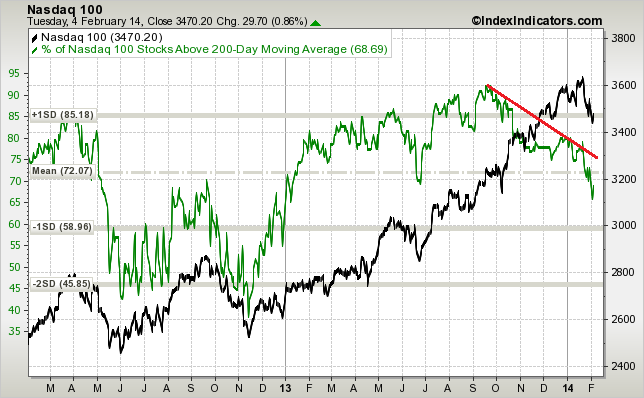 Also not sure if the decline fit the bill % wise on the S&P. Anyway took profits on shorts today. Just watching and waiting now. 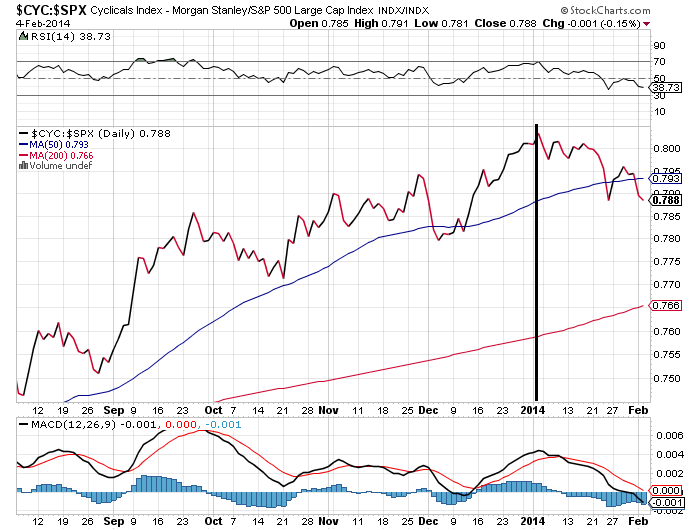 Hi, John, do you have the updated chart of Citigroup Economic Suprise Indicator? In your post 5 higher are you saying that all those criteria have been met or that’s what you are looking for? Ever since the beginning of your blogs you have always said when you are taking action……you don’t seem to any more is that a conscious decision? Yes I used to post every trade open and close, when my trading was more leisurely and I was making few trades overall in a year. I’m currently opening and closing trades every day so that’s what’s changed. But I will summarise my positions in a coming post. John, have you covered some of your short positions? Thank you John…I also have taken some profits…so Let the lower high gets built. History says the Second Chance top should be in the vicinity of SPX 1820 which is less than 3% higher than where we closed today! Thanks John for your articles. I always learn something new (and useful) from them.